You know what I rarely cook with? Cream. Usually I leave the cream out of the dishes I make because, well, it’s cream and I’m not all that into fat or additional calories. But I have learned that sometimes a little cream can go a long way and turn a dish from pretty good to really good. We like foods with some zip. Luke loves chicken. I love pasta. Maddy loves chicken and pasta. For a while now I have been playing around in the kitchen tweaking and testing this cajun chicken pasta recipe. Even though cream is rarely on the shopping list, after making this dish a couple of times it was evident that a little cream was in order to thicken and richen-up the sauce (is richen even a word? I don’t think so but I feel like it needs to be used here). The addition of cream was just what my darling pasta needed. The recipe below includes my version of cajun seasoning, I prefer to make it at home because there is way less salt in the homemade version that the store bought stuff. Use whatever makes you happy. Anything thinner than linguine (i.e. spaghetti or angel hair) is just too thin to handle the chunks of chicken, and veggies and you will end up with something mushy. As far as spice goes, feel free to start small and add more if needed. I use at least the amount of cajun seasoning listed if not more, but I like spicy. Oh, and one last thing. Serve this pasta with a huge slice of toasted garlic bread, because according to me it is a crime to not sop up the leftover sauce with garlic toast. Bring a large pot of water to a boil and cook linguine to until al dente, or to package directions. Once cooked to al dente, drain noodles and set aside. Sprinkle 1 teaspoon cajun seasoning over cubed chicken and toss to coat. Heat a large saute pan or cast iron skillet over medium high heat. Saute seasoned chicken in 2 tablespoons olive oil until cooked through. Using a slotted spoon remove cooked chicken from pan and set aside. Add broccoli and 2 tablespoons olive oil to pan and saute for 1 minute. Add bell peppers onion and garlic to pan. Sprinkle one teaspoon over vegetables and toss to coat. Cook vegetables for 2 minutes. Add tomatoes to pan. Turn heat down to medium and add wine and chicken broth to pan. Stir and scrape pan to thoroughly deglaze. Simmer mixture for 2-4 minutes. Add cream to pan and whisk or stir continuously. Once mixture starts to thicken slightly add the cooked chicken to pan and cook for 1-2 minutes or until chicken is warmed. Add additional cajun seasoning to taste. 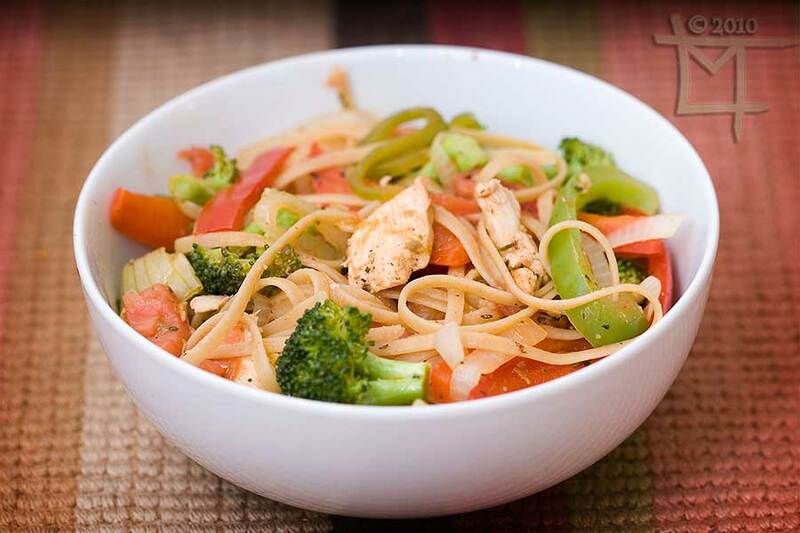 Pour chicken, vegetables and sauce over drained linguine and toss the mixture to coat the noodles. Mix spices and herbs together thoroughly. Store any leftovers in an airtight container. This looks so good. I think I am going to make a variation of it for our dinner.